Mordian 7th Regiment: 40k Objective Markers Complete, and the start of something big! 40k Objective Markers Complete, and the start of something big! Finished off the objective markers this past weekend, and got a nice little package from shapeways containing the next batch of bits for the next project. It's Christmas in July (but only just)! Nothing too crazily different from the last shot, other than some cleanup, the addition of the number markers (the 5 is on the backside of the stasis tank) and some quick color on the bases. Nothing too fancy but they'll stand out nicely on the table during a game! Overall I really enjoyed this set, and am looking forward to giving 'em a whirl. Next up however is a nice big centerpiece model for the Zhao Arkkad force - A Knight Warden! I came across these poseable knight legs on ebay a while back and rather liked the look of 'em, but they've been sitting in a box waiting for some inspiration. They went together rather well, and allow for a nice range of motion - I was going for a 'striding forward' pose, but the way it ended up the weight of the hips actually settles on the rear leg so it may end up in a braced firing position in the end. We'll see how the upper torso and arms come along I suppose! Speaking of arms, I intend to give it a gatling cannon and a missile pod, but wanted to do something a little more Egyptian for the close combat weapon - Found a massive chain khopesh on Shapeways that fits the bill nicely! I also picked up a rather neat Anubis/Jackal head but am saving the pic of that until I get it mounted on the torso. Suffice it to say there'll be no doubt that it's a Knight aligned to the Zhao Arkkad Mechanicum and the Thousand Sons! From a color theory standpoint I'm planning on going blue and yellow as a contrast to all the red and white of the rest of the force as well as a nod to the color scheme of the modern era Thousand Sons. Looking forward to getting some more build time in on it! Good stuff, those knight legs look good, and I can't wait to see your Anubis knight striding across the battlefield, that will look incredible! The objectives look great all finished up. The knight will be awesome when it's don I am sure, I've seen the shapeways bits before, the head is cool! Those markers look sweet! You'll need to get some photos of them in action. You've sold me on the obj. markers, great job. That knight looks like it might be a bit special. Looking forward to seeing more. Posable legs! What an epic find. I remember spending hours cutting my first knight up to repose it. This is far better, and probably much more durable. I like the posing of those legs, definitely bracing for firing. Oh wow! Looking forward to seeing how the knight goes. My 40K Sons have one in a box for heavy conversion soon. 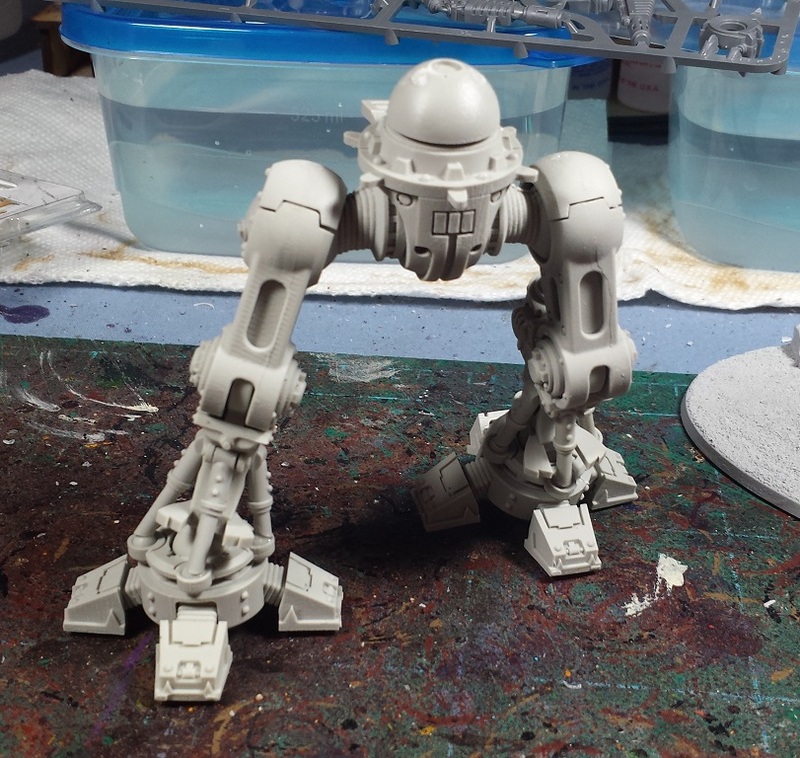 Not tempted to use the "one GW leg and one posable leg on two separate knights" thing then ? @Phil Curran: Thanks! It's been fun to work on so far! @Bronislaw Czevak: Thanks! I had seen the Space Wolf variant bits he'd done a while back and was jazzed to see some Thousand Sons style pieces in his shop recently! @Mochael Corr: Thank you! Will do! @John Stiening: Haha! You got farther than I did - let's just say there's half a knight in a box in the Closet of Doom that suffered greviously in my attempts to repose the plastic legs. @Sir Tainly: THanks very much! @Rory Priest: Excellent! The khopesh and head are from a designer called ComradeQuiche on shapeways, if you're interested! @Zzzzzz: Not a bad idea, I have a couple more sets of the posable legs, splitting them up in a mix-and-match with the plastics might be cool!